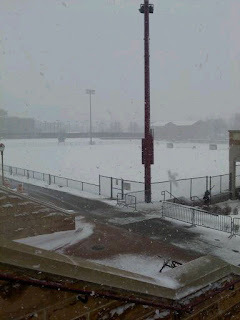 We are in Denver for spring break (playing DU tomorrow). I'm sitting in the lobby waiting for Grandma Babs and mom to get here from the airport. It is a total blizzard. Yes, we left 70 degree weather to come here for spring break. But it's okay, because it's business, and we'll be home with a win by Sunday night. It was fun preparing our gameplan in this weather.. but it's totally fine because I only have 2 months of this left for my entire life. Scary. And sad. DU win tomorrow! Go RU. gotta love the unpredictable weather huh. did you see they lost to UND in hockey last night? watched the game. there are 2 moorhead guys on DU. 1 on UND. talk about a powerhouse of a city we live in! it's a just going to be a sad weekend altogether for the pioneers. hopefully grandma finds some warm deerfield sweatshirts in that knowlton closet. nice job on the first post. so fun in Denver. a little later sunday morn plane would have helped. great win and the sun was wonderful and not cold. great season so far faithie!